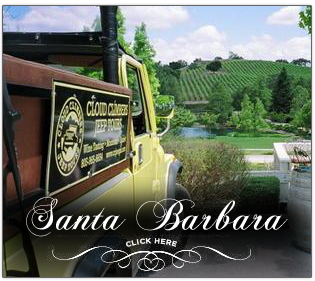 the Old Stage Coach Road, past Lake Cachuma to the exquisite Santa Barbara Wine Country - with its sprawling ranches and endless miles of orchards and vineyards. a special glimpse of Ojai which celebrates the history, flavors and many remarkable qualities that the beautiful Ojai Valley has to offer. 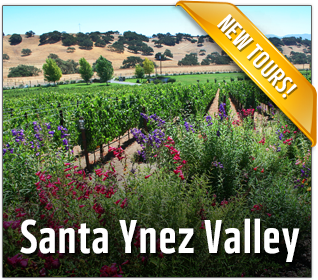 Back-Country Wine Tours departing from the Santa Ynez Valley starting at 11am. Looking for something to do in Ojai? 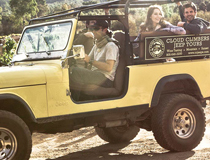 Check out the latest coverage of Cloud Climbers Jeep & Wine Tours on the Ojai visitors bureau website. 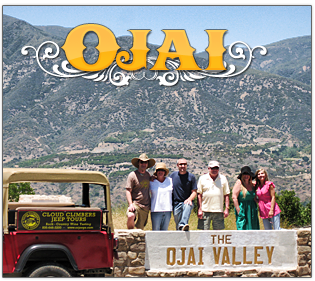 Don't forget we have tours leaving daily in Ojai click here to get more information. Explore miles of scenic trails. Visit local farms to pick produce or see how olive oil is made. Or stay close to town … and enjoy shopping, dining and an array of cultural offerings.